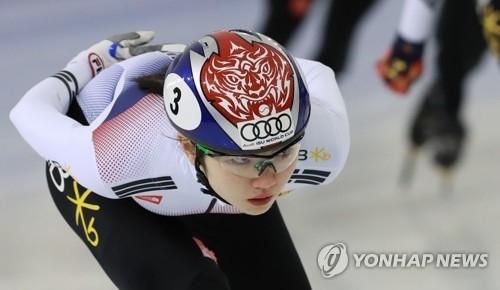 SEOUL, Jan. 18 (Yonhap) -- Olympic short track speed skating champion Shim Suk-hee has been reportedly assaulted by her own coach, leading to the instructor's suspension with the PyeongChang Winter Games less than a month away, sources said Thursday. "Shim went AWOL from the Jincheon National Training Center on Tuesday after a disturbing incident with a coach on the national team," said a source inside the skating community who knows Shim well. The source, who asked to remain anonymous, said the coach was believed to have assaulted Shim, prompting her to abandon her training. "I'm aware that there's been tension between the two, as Shim's pace hasn't been maintained ahead of the Olympics," the person said. The coach, who has mentored Shim since the early part of her career, has been suspended by the Korea Skating Union (KSU). Shim later returned to the training center. "We suspended the coach after being informed of the incident by the national team. We're still in the process of confirming what exactly happened," a KSU representative said. The team's training has resumed under the leadership of Park Se-woo, who coached the country at the 2006 Torino Winter Olympics. Shim, 20, anchored South Korea to a gold medal in the 3,000-meter relay at the 2014 Sochi Olympics, while also winning silver in the 1,500m and bronze in the 1,000m. She and teammate Choi Min-jeong have dominated the women's short track in recent seasons, but Shim will be a sentimental favorite at the Olympics as she was born in Gangneung, a sub-host city that will hold all the skating events during the Olympics.